Greetings and welcome to Tip :004 toward becoming a better steward for our home and planet. 1:5:10:004 Tip: Many home appliances have a “trickle” current that is running 24:7 when the item is in standby mode. 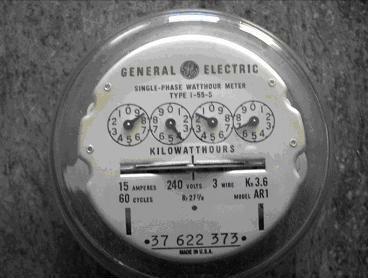 You can use your homes electric meter to find out how much hidden electric use there is in your home. This is easiest if you have a dial type electric meter, but can also be determined if you have a digital electric meter. The first step is to be sure that all your lights and appliances are switched off or in the case of the refrigerator, furnace and air conditioning that they are not running. By timing how long it takes the spinning wheel on you electric meter to rotate, you can calculate how much electricity is still being used. Granted some of this “trickle” of power is for things like smoke detectors or clocks which you want running all the time, but a significant number of appliances can be switched off so they don’t waste this energy when they are not being used. To learn how to calculate how much “trickle current” your home is using, you will need all the information you have collected and recorded in your journal (:001 to: 004). The specific instructions follow in the additional information. Tomorrows tip (:005) will teach you how to calculate the specific power usage for specific appliances. That’s my 1:5:10:004 tip for today. Step 1. Time how long it takes the dial on your meter to revolve one time. This is approximately one fourth of a kilowatt (250 watts). Step 4. To determine how much you are spending each hour at this level of electric use multiply the rate you are paying per kilowatt hour (check your :002 entry in your journal) by the number you calculated in step 3. Example: I am paying $0.229 per kilowatt hour so the trickle current is costing me almost six cents ($ 0.0586) an hour. Step 5. To determine the total cost per day at that level of electrical use multiply your answer by 24 hours in a day. This may not seem like a lot, but if this excess electricity use were eliminated, the monthly bill could be reduced by over $40.00. It is important that nothing electrical changes while you are timing the rotation of the dial. If the refrigerator were to come on it could significantly affect your results. Don’t forget to record your calculations and findings in your journal. You may want to repeat the timing of the rotating wheel a few times to be sure it is fairly constant. If you find big differences in the amount of time it takes for one revolution, there may be something using intermittent power that you aren’t aware of. If you have a digital power meter it will take much longer to determine your power use since these meters will usually only measure in tenths of a kilowatt hour. This means using the previous example it would take approximately 24 minutes for the meter to go from 15232.2 to 15232.3. Tomorrow’s tip will include information about monitoring electric usage for individual appliances that can help over come this shortcoming for digital meters. Don’t forget to record the 1:5:10 time spent and your total hidden electric use in your journal.